Professional Football Chiropractic Society symposium highlights the expanding opportunities available to DCs. Dr. Kyle Prusso, vice president of the Professional Football Chiropractic Society, is the team chiropractor for the Oakland Raiders. 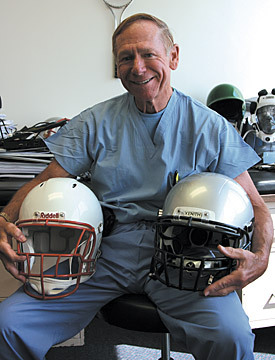 He is a graduate of Life Chiropractic College West and practices in both Livermore and Oakland, Calif.
Dr. Robert Cantu, clinical professor of neurosurgery at Boston University School of Medicine, co-director of the Neurological Sports Injury Center at Brigham and Women’s Hospital, and senior advisor to the NFL’s Head, Neck and Spine Committee. Dr. Cantu presented to a room overflowing with more than 130 chiropractors, chiropractic students, and representatives from the NFL. His three-plus hours of presentation consisted of current research, standard practices for diagnosis and management, as well as answers to questions from the audience. Dr. Cantu proposed the potential benefits of working with a chiropractor to relieve the secondary complaints from a concussion. Cervical nerve-root irritation producing headaches, as well as burning facial pain, reddening of the face and sympathetic nervous discharges, can be managed conservatively and shorten overlying symptoms that would have kept an athlete out of play. Dr. Doug Miller, team chiropractor for the Baltimore Ravens, commented, “Dr. Cantu’s lecture brings to the forefront the importance of proper technique, evaluation, and management of concussions. Dr. Cantu’s presence exemplifies the PFCS’ mission to “educate and communicate” with the chiropractic community, allied health care professionals and the NFL. Educate: It turns out that it’s not just our patients who need to be educated about chiropractic. There are regular opportunities to discuss chiropractic and its benefits with other members of the medical staff. Educating the team and being aware of our role aids in solidifying our place at the training table. The other half of the “education” part of the mission is to educate other chiropractors. Early in its existence, the PFCS realized that team chiropractors are privy to a wealth of knowledge and information that rarely trickles down to the profession. It became part of the mission to share this knowledge and information. Communicate: The PFCS is the organization working to establish chiropractic in the National Football League. The board of directors confirms the status of each team’s chiropractor annually. This is accomplished by direct communication with team athletic trainers, medical directors or general managers. Team chiropractors are encouraged to maintain clear lines of communication with other members of the medical staff, including athletic trainers. Working within the parameters of a medical staff’s dynamics is paramount to the success of the chiropractor. 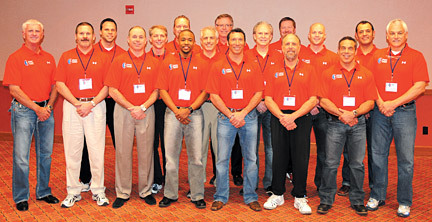 The PFCS Annual Education Symposium is held each year in Indianapolis, coinciding with the NFL Scouting Combine. Each year, more than 300 of the best college football players are invited to participate in the combine. Top executives, coaching staffs, player personnel departments and medical personnel from all 32 NFL teams are on hand to evaluate the nation’s top college football players eligible for the upcoming draft. This intense, four-day job interview is an exciting time for the athletes and a vital step in achieving their dreams of playing in the NFL. The PFCS symposium is a result of the desire to share knowledge, educate chiropractors, and be a resource to the profession. What started out as a small meeting of a few team chiropractors has grown into a two-day event with expert presenters, hands-on training, and a weekend of networking with some of the profession’s best sports chiropractors. This year, in addition to Dr. Cantu, the PFCS was proud to have extremity guru Dr. Dan McClure and his hands-on workshop. Kevin Morris, head athletic trainer for Brigham Young University’s football team, presented case studies and introduced his integrated approach to treating football injuries. And Dr. Jeff Lease finished off the weekend with an introduction to elastic therapeutic taping. Each year, chiropractors travel from around the country to be a part of this symposium. There were student representatives from Palmer College of Chiropractic West, the University of Western States and Life University, and a large contingent from Logan College of Chiropractic. The Professional Football Chiropractic Society stand united at the 6th Annual PFCS Convention in Indianapolis: Left to right: Drs. Curtis Maynard, Arizona Cardinals; Tony Iselborn, Jacksonville Jaguars; Joseph Krzemien, Atlanta Falcons; Frank Brady, Philadelphia Eagles; Chris Sanders, Houston Texans; Doug Miller, Baltimore Ravens; Marcus McCray, Indianapolis Colts; Alan Sokoloff, Baltimore Ravens; Joe Leahy, San Francisco 49ers; Sol Cogan, Detroit Lions; Mike Miller, New England Patriots; Kyle Prusso, Oakland Raiders; Rob Lizana, New Orleans Saints; Kevin Turley, Arizona Cardinals; Spencer Baron, Miami Dolphins; Hirad Bagy, Washington Redskins; Chuck Woosley, Tennesse Titans.